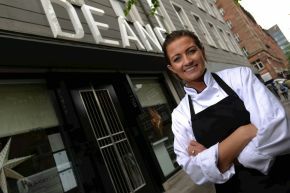 After graduating with a first class honours in culinary arts management, Ulster University graduate Hollie Forde has landed her dream job as a pastry chef working alongside Michelin Star chef, Danielle Barry at Michael Deane’s renowned fine dining restaurant, E.I.P.I.C. After graduating with a first class honours in culinary arts management, Ulster University graduate Hollie Forde has landed her dream job as a pastry chef working alongside Michelin Star chef, Danielle Barry at Michael Deane's renowned fine dining restaurant, E.I.P.I.C. "My love of baking began when I was 14, I used to bake at home and sell my own products. I also used to work for free every Saturday in my local bakery just so I could do what I love and to gain more real-life experience in the catering environment. It was during this time that I knew this was the career for me. "In an evolving and dynamic industry, Ulster University was the obvious choice for me when applying to university, with the opportunity to gain a wealth of knowledge and direct access to highly skilled industry professionals. During my course I got the opportunity to learn from Michelin Star chef Danielle Barry at Deanes who provided me an amazing insight into the culinary world. "The culinary arts management degree at Ulster University offers a working placement year and I knew that this would be the ideal opportunity for me to break into the industry. "Originally, I planned to stay at home for my placement year but when the opportunity arose to apply for a position within Gleneagles, in Scotland, it was something I couldn't miss. There was only one position available in the pastry kitchen and open to the whole of the UK and Ireland, I knew the competition would be tough." Hollie beat off national competition to secure the year long placement with Gleneagles in Scotland, packing her bags and launching her career in the food industry. "After only three months working for Gleneagles, I was selected to work as part of a specialist team of ten chefs to cook for the European Ryder Cup team. Working over 19 hours a day for 10 days to cover the workload, meant long days and hard work but it was definitely one of the highlights of the whole year, providing me with invaluable skills and experience that I can bring to my future career." Following placement year, after a recommendation from the Head Chef in Gleaneagles, Hollie spent the summer working as a pastry chef in Claridge's London, in their main pastry kitchen and one month in the Michelin star restaurant, Fera. She was part of the team that launched the Wimbeldon afternoon tea menu and designed the winning macaroon for the luxury designer fashion house, Burberry. "Returning to final year, my lecturer Audrey Clements introduced me to Michael Deane and we got chatting about my previous experience. This led me to meet Michelin Star Chef Danielle Barry, who offered me a part-time job at E.I.P.I.C while I completed my final year of University. "Since graduating I have secured a full time position with E.I.P.I.C. To be starting out in my career, learning from one of the only female Michelin Star Chefs in Ireland and one of an elite group in the U.K, I feel incredibly lucky and hope to continue this journey with Danielle for as long as possible, learning from the best. I can't thank her enough for all her support as I start out in my career."